Scott Houston from Executive Risk Solutions and Glenn Ferrarotto from Ironside Recruitment would like to invite Human Resources (HR) Managers and Heads of Corporate Social Responsibility (CSR), to attend a luncheon, to assist them with the development of an industry friendly Military Veteran employment program. Scott and Glen are both ex-military veterans and have a passion for assisting servicemen and women in transitioning from the military into the civilian workforce. 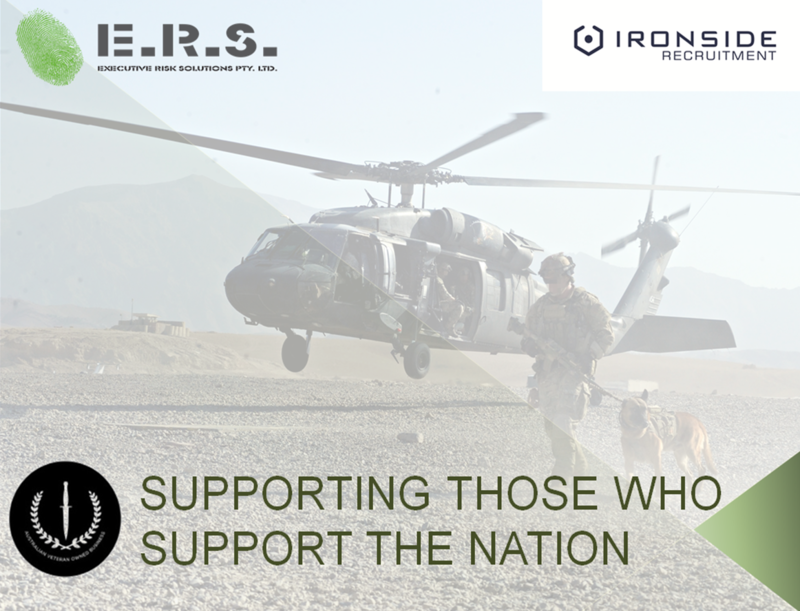 On the 11th of August ERS and Ironside will be hosting a free luncheon at the Trustee where in a casual and relaxed environment they can gain industry feedback from HR and CSR experts, on the future development of veteran employment programs. Several initiatives are currently underway but ERS and Ironside would like your feedback in further developing these programs. If you would like to join us and share your opinion and experience on how to improve veterans employment, contact Anne-Eline Roberts anne-eline@executiverisksolutions.com.au before the 05th of August.